Seems like everyone has gone to Nuvali save for me. I didn’t even know that it’s in Laguna, all this time I thought it’s in Tagaytay. Recently I went and corrected the error by accepting the invite to try this newly opened burger joint called, Beefy’s New York Grill. It’s located in Ayala Malls Solenad 3. I and the rest of the rest of the KTG gang were received warmly by one of its owners, Chef Marc Nocon. The first thing that you will notice upon entering this place is the graffiti on the walls. The overall design of the interiors I would describe as artistic and casual. The front and side walls are made of glass letting in natural light. 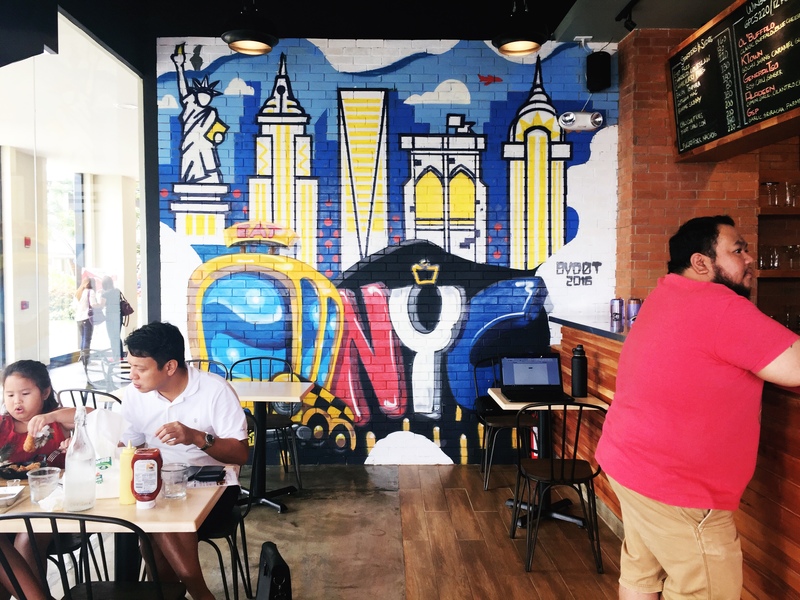 The brick walls inside have illustrations of New York landmarks that didn’t go shy with colors. 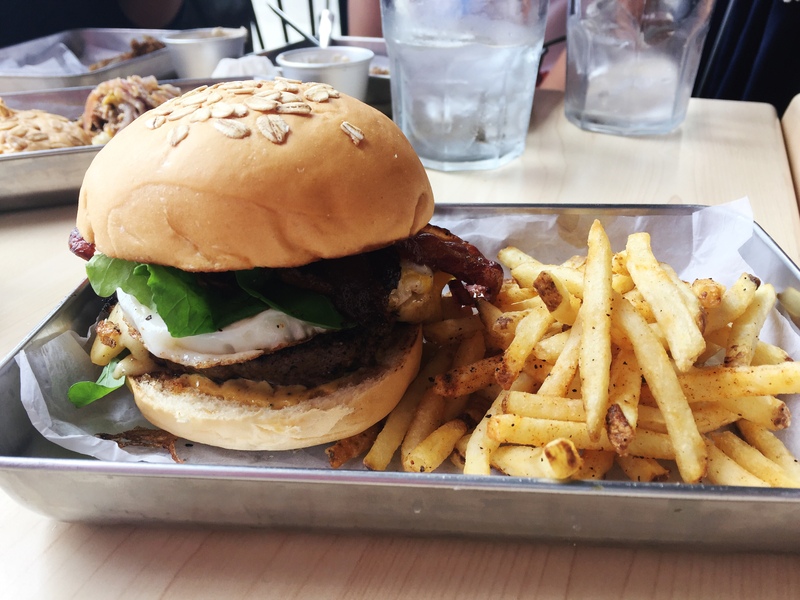 Beefy’s applies a fast-food concept; you pay as you order. Check Marc allowed us to order whatever we wanted but he also served us food that he thought we should try. So let’s get on it. If you’re on a diet you would be happy to know that Beefy’s has Mrs. Tso Salad (PHP 160 – USD 3.21). It has fresh chopped romaine, Tso chicken, sweet peppers and onions with sriracha dressing. It’s so good you’d wonder if it’s still healthy. I can honestly order this without feeling like I am being deprived of good food. Nachos is my favorite “pulutan” when I go out drinking and if I could take That Chili Con Nachos (PHP 200 – USD 4.01) on all my drinking sessions I definitely would. It has chili con carne, cheddar, mozzarella cheese, sour cream, salsa, topped with half-boiled egg. 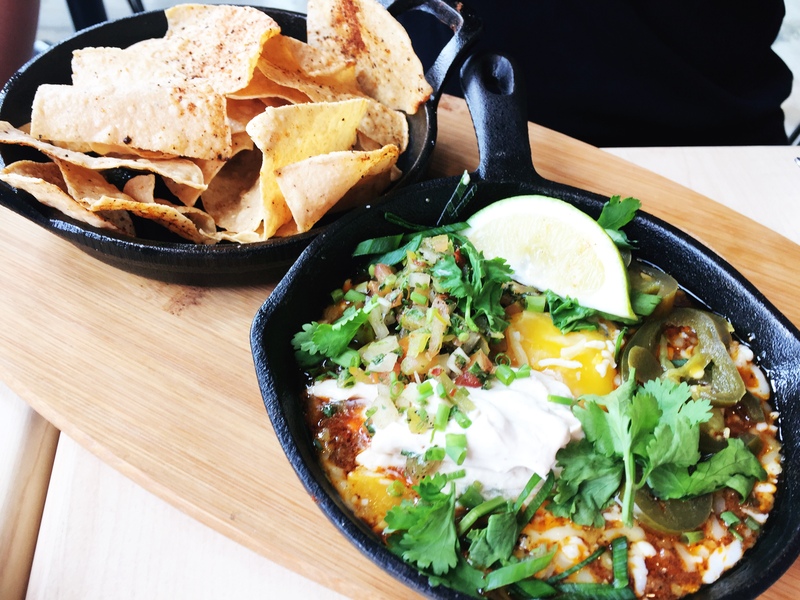 You mix everything in, egg and all to before you dip in them nachos. It was terrific! 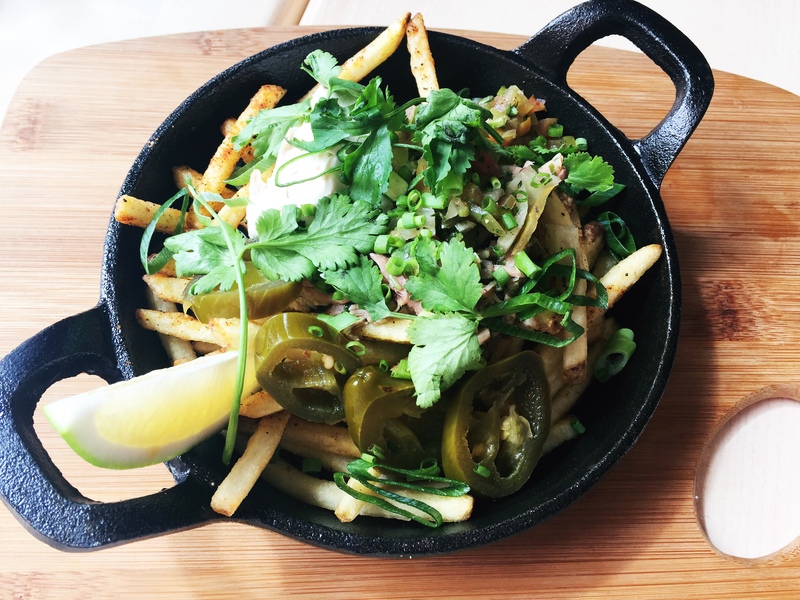 If you’re more of a fries person then order Chimichurri Fries (PHP 220 – USD 4.41), a medley of braised pork belly, chimichurri, sour cream, and salsa. I like that fries are very thin, it somehow makes eating more pleasurable for me. 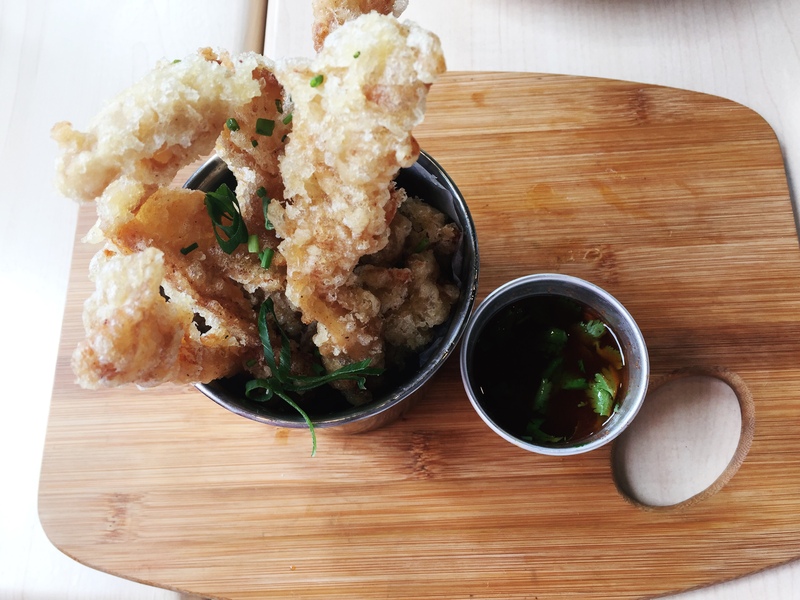 Have you heard of a bacon tempura? No? 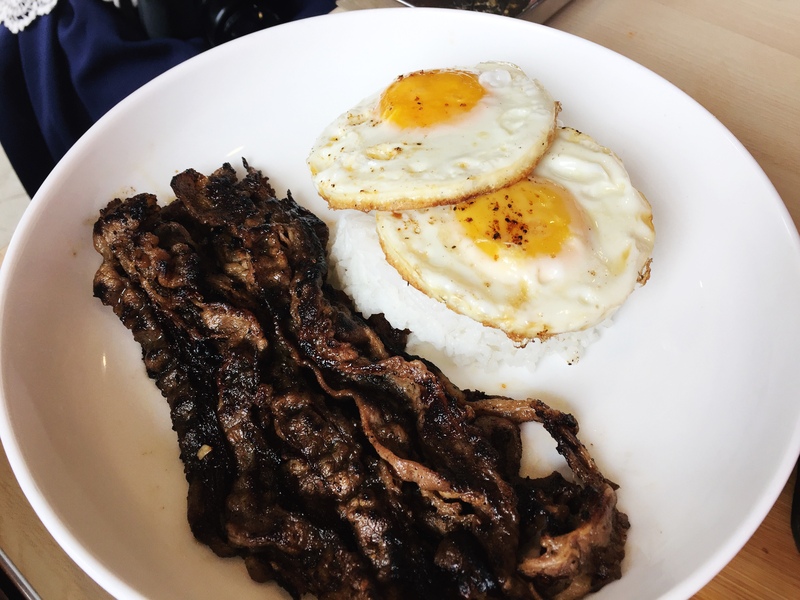 Me too, until I saw Beefy’s East Village Bacon Tempura (PHP 180 – USD 3.61). 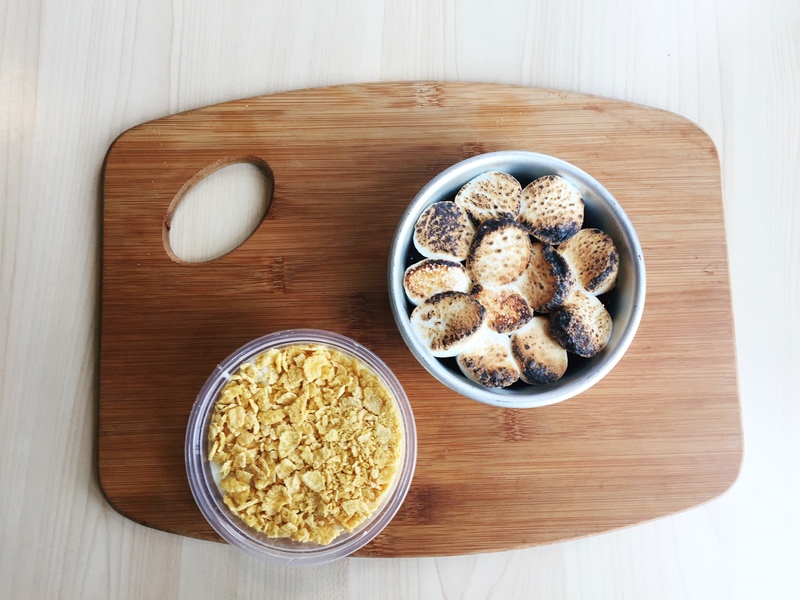 Great news to bacon lovers, this snack has all the makings of becoming your new favorite. I’m not big on bacon yet I loved it. Spam with rice is cool, spam sandwich even better. Now how about turning it into Spam Chips (PHP 180 – USD 3.61)? Yes, it’s now available and it’s ridiculously addictive. 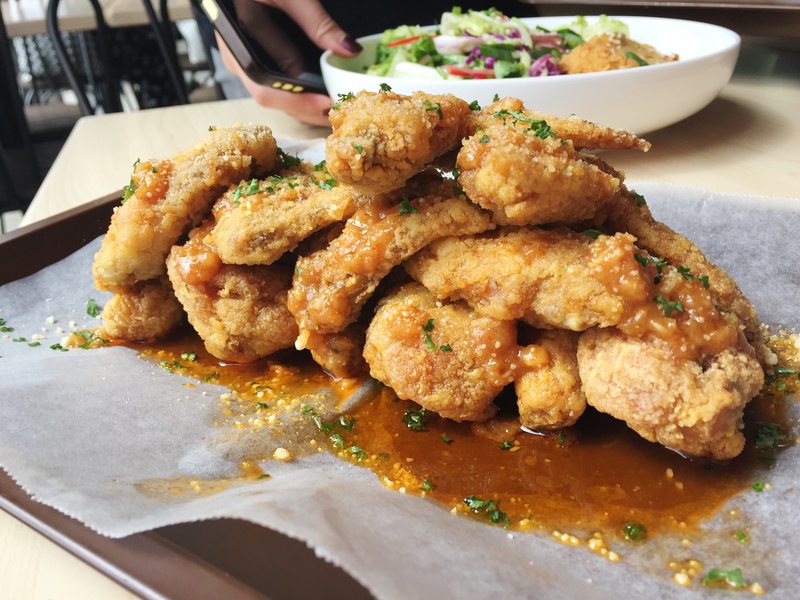 We were served with two kinds of chicken wings flavors; General Tso (PHP 220 – USD 4.41) and Aladeen (PHP 200 – USD 4.01). Both are yummy but of the two I prefer Aladeen. It’s salty and earthy taste almost made me forget that there are other food to try. I think I can easily finish 6 pieces of it on my own. Now let’s go to the sandwich. If you prefer chicken over beef, there’s Tso Fried Chicken (PHP 240 – USD 4.81). 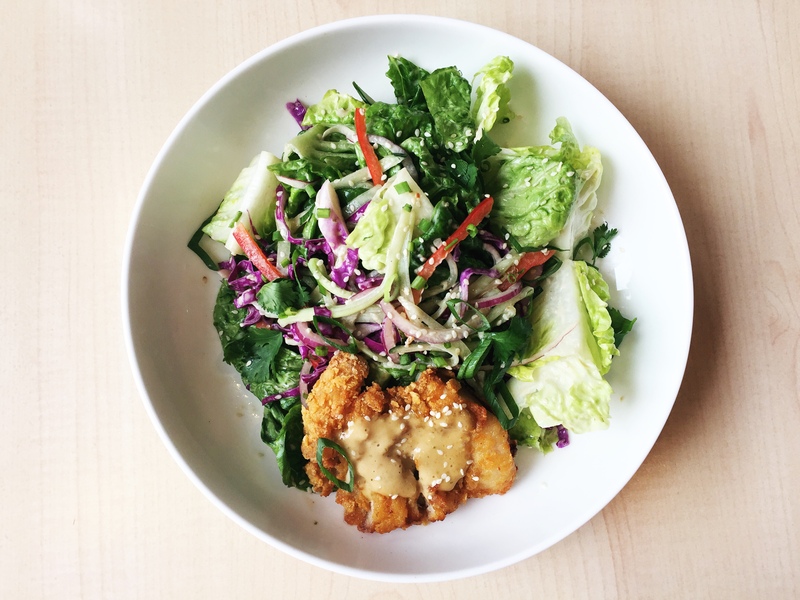 It’s cornflake crusted boneless chicken with general tso sauce, charred coleslaw, and lettuce. 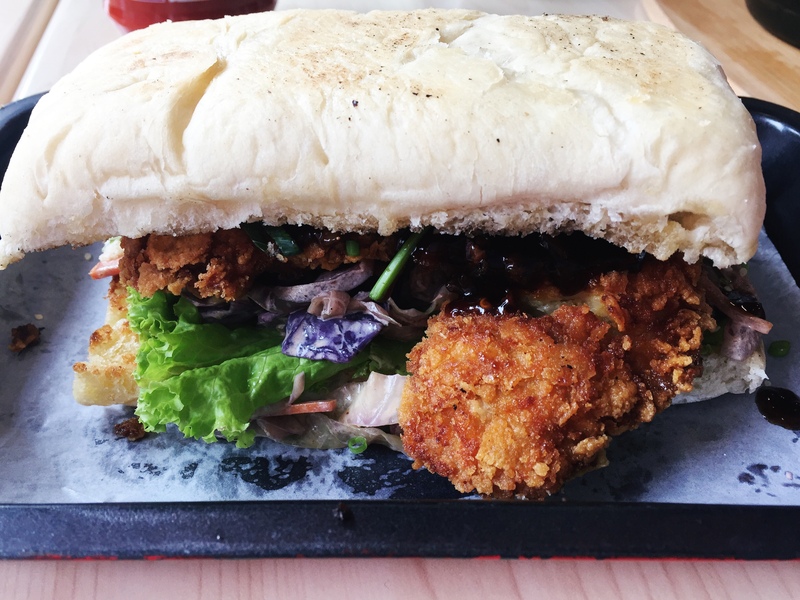 This sandwich is so big it’s like a full meal in itself. 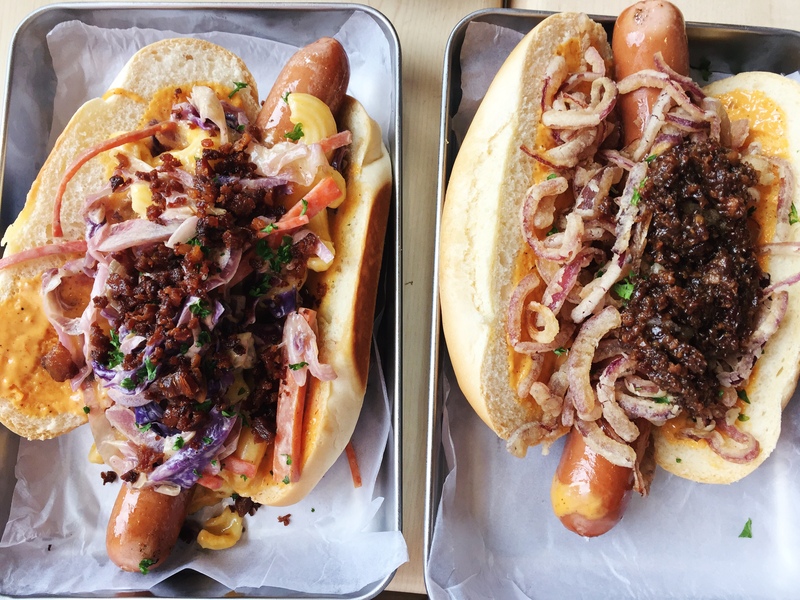 The Franchise (PHP 200 – USD 4.01) is that big hotdog sandwich packed with gotham mac, bacon crumble, and charred coleslaw. The only reason I wasn’t able to fully appreciate it is because I was already full by the time it reached our table. I thought Notorious was already a badass until I saw Beefy’s Tribeca (PHP 325 – USD 6.51). This is a triple patty, triple emmental cheese with bacon jam, onions and peppers, supah sauce, lettuce and tomato. Yes triple patty because I don’t know, maybe double patty is not good enough for you, haha… Kidding aside this burger will rock your world. Of course it’s more challenging to eat than Notorious but as they say good things don’t come easy right? Lol. 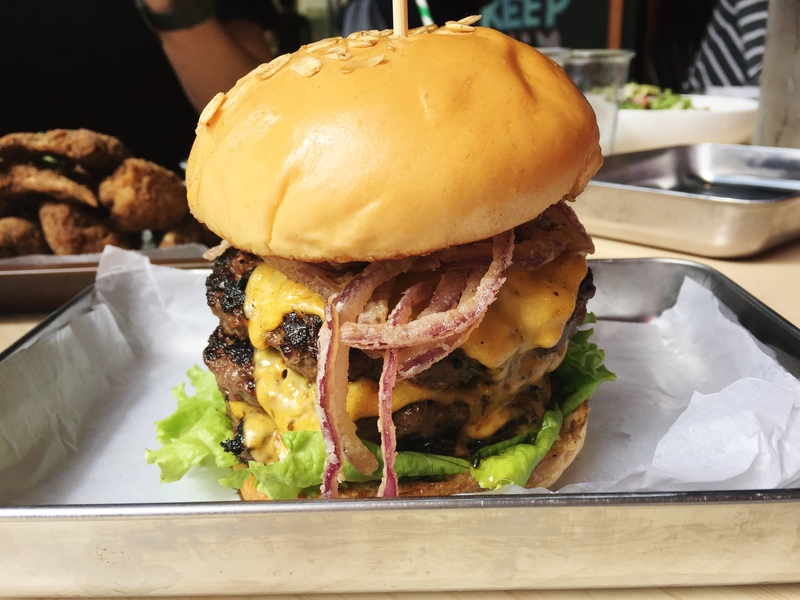 The Empire (PHP 260 – USD 5.21) is almost the same as the two burgers, the difference is, it only has a single patty and it has an egg. It also has bacon, fried red onions strings, and arugula. Now if you’re more of a rice person, don’t worry, Beefy’s has rice meals too. There’s the Chicken Fried Steak (PHP 200 – USD 4.01) and The Tapa (PHP 240 – USD 4.81). 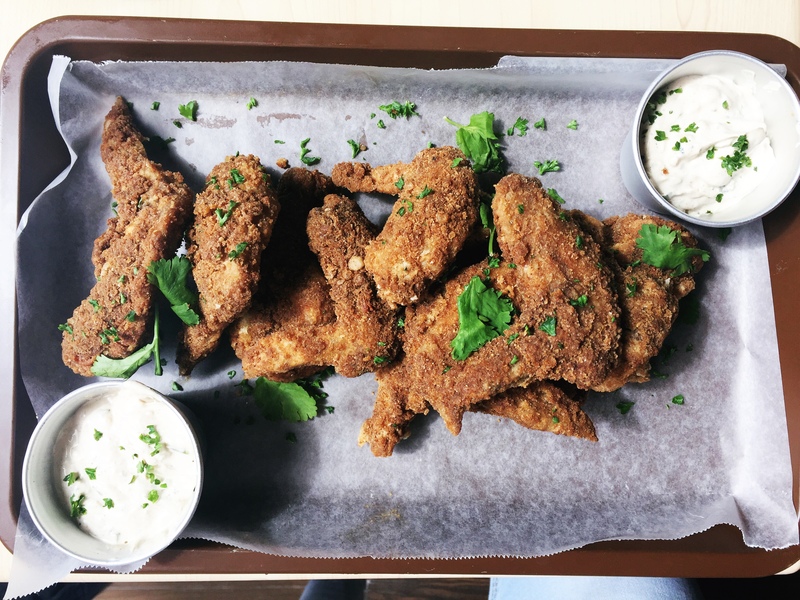 It was served later in the game so I wasn’t able to try them anymore as my tummy was already bursting. But if you know me, it shouldn’t surprise you that I leave room for desserts (really, it’s my policy). So we had Wiffle Waffle (PHP 160 – USD 3.21), Bananacotta (PHP 120 – USD 2.41), and S’mores (PHP 120). 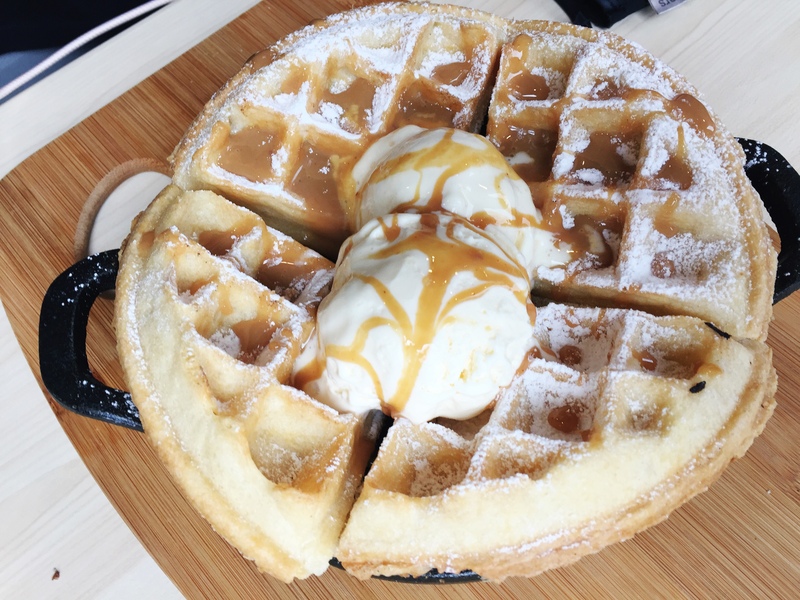 Not sure if it’s due to the ice cream that I loved the waffle. I also like it’s crisp exterior but down the middle it’s soft. For the taste and the big serving, I say Beefy’s price is reasonable. It is definitely worth that one hour or so drive to Nuvali. Waaah. i have never been to nuvalli yet. I too love nachos. That nachos is a bang! As in super duper looks delish! Even the fries was served in a plating that makes it looks so mouth watering. Will make this on top of the list when i go there. Marge, Nuvali is nice ano? I had no idea din before where it was and the first time I heard of the place was when my kids studied as Xavier School. Doon ko nalaman na merong XS sa Nuvali. Apparently, Ayala gave them a piece of the land where they built a branch. Because of that, it helped in boosting the value of the properties in the area. Looking at Nuvali, there are lots of food choices there. I think this one you went to, Beefy’s, is one that I could also try if I find myself down south. I would love to sample their chicken wings. One pet peeve, I hope they are not counting ONE chicken wing as two pieces. 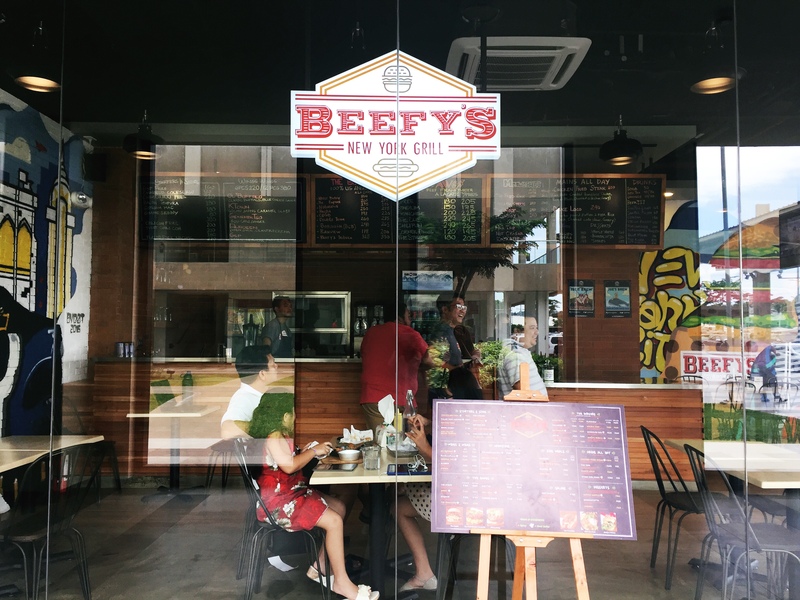 i also thought nuvali is in tagaytay 😮 beefy’s food are really worth the drive! id love to try the madwiches first!!! Ahh! I love your food reviews Marge! They always seem to make me hungry hehe. And this is definitely another resturant I’ll be adding to my “Places To Eat List”. YUM!!! The burger looks so good but I really really want to try the waffles hehe. those burgers looks amazing! i was totally lured in by the burger pic in your thumbnail! hahaha! we have spam fries here in sg and they’re like the best creation ever! but actually we all know we can have the same dish at a fraction of the price at home, but we just have to go to a cafe and order it! never heard of bacon tempura before! i’m sure it’ll be da bomb for bacon lovers! Marge! I love this!!! The food all looks delicious and well made. And the place is so instagrammable! I love how artsy it is and at the same time, elegant and classy. I wonder, should i also visit the place! I DEFINITELY WILL! I really liked the looks of the food! Although this is very far, it’s great to know such restaurant exists in Nuvali. It’s like the restaurants I find here In Quezon City. For me what I’ll probably order is the wings. They look crisp with good batter. Hoping to try Beefy’s!!! 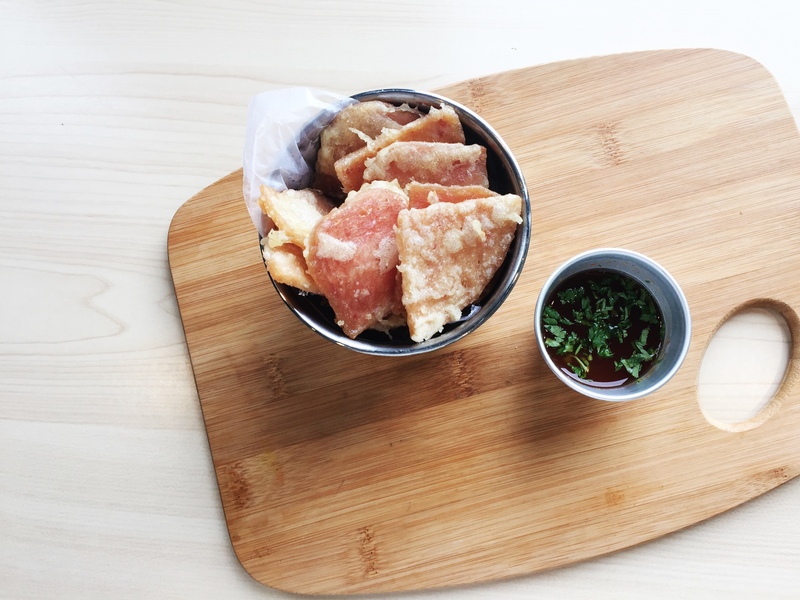 You had me at the bacon tempura and spam chips. Egad! I have to try this next time we Joe off down south. I’ll surely need to bring my cholesterol aids, haha!